Since the 1980’s, NCES has been creating leading nutrition education products. But, do you know how it all started? I’m sure many of you do because you’ve been right here with us through the entire journey. But, for others, we’re excited to take this opportunity to share with you the evolution of our flagship product, now titled the “Healthy START” series of handouts. It all started back in the 80’s with the extremely ‘cool cat’, Nutri-Cat! Nutri-Cat had a great job. He was responsible for encouraging people of all ages to eat healthy and exercise, similar to the way a team mascot would cheer on his team. The first handouts, featuring Nutri-Cat, utilized the food pyramid that had carbs at the bottom and fats and oils at the top. This handout was able to hold on strong for many, many years. However, in 2005, it was time for an update. Based on new research and standards, the USDA updated their base food pyramid to a side-by-side food pyramid with steps moving up the side. At this time, we decided that Nutri-Cat had done his job as we retired him from the series of handouts. We also added more information on exercise as nutrition standards were putting a larger emphasis on exercise as part of a healthy lifestyle. In 2011, we introduced the Healthy START handouts you know and love today! 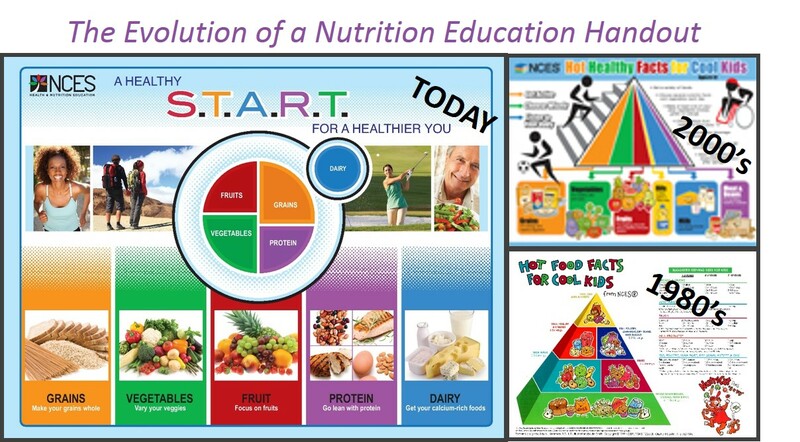 In response to the USDA’s updated 2010 Dietary Guidelines and the introduction of MyPlate to replace MyPyramid, we went back to the drawing board and crafted an entirely new educational handout to fit the needs of our health and nutrition education customers. We also thought it was important to provide an acronym that would help readers live a healthy lifestyle, which is where the START concept was born. This simple acronym provides everyday instructions to help reader’s jumpSTART their healthy lifestyle. Coming up with the components of the START concept were easy too. The USDA had just released five topics they intended to emphasize over the next five years. These became the pillars of our START concept. And that’s how a star is born! These Healthy START handouts continue to be one of our best selling products here at NCES. For almost 30 years, these handouts have brought nutrition education to the masses. With solid information reflecting the most up-to-date research and science behind health, wellness and fitness, these handouts are a great fit in every nutrition education setting. To learn more or place your order today, visit NCEScatalog.com. You can also always contact us. Our on-staff dietitian is here to answer your questions! Before you go, take a second to connect with us on Facebook and Twitter, and sign up for our newsletter! I like it a lot but the only thing missing is the water! Hi Kathy! Thanks for your feedback. We do offer the Beverages 101 handout that focuses on making healthy drink choices and the importance of water. Drinking plenty of water before, during and after exercise is encouraged on the back side under the 10 Steps to a Healthier You of the Adult START handout. But, I definitely agree that bringing more attention to the importance of water is a tip worth considering when we are ready to revise this product again! Thank you again for your feedback! It’s great to hear from you!